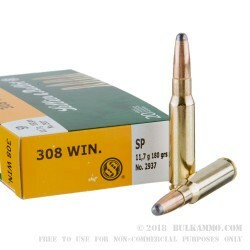 A great .308 Winchester ammunition that fits right in for bolt actions but can also be used pretty effectively in semi-auto guns. 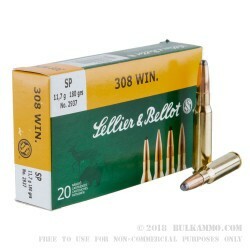 This is Sellier & Bellot’s hunting specific load with a soft point projectile in the 180 grain weight and it is a potent mix of heavy hitting performance and reliable build quality. The price is about at parity with the normal loads on the market, but the quality of this manufacture is exceptional. If you can handle the blunt tip soft point profile, this is a very nice round to have a large amount of. 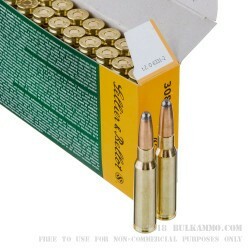 This is a 500 round case that is priced at the middle of the market and outperforms most of the market hands down. 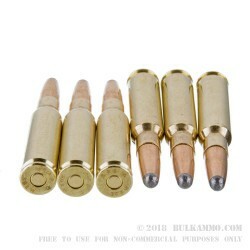 This is a large projectile loaded into a very high-end piece of brass and fitted with a Boxer primer to make it easy to reload the premium brass and is charged with a very clean burning potent powder charge. These components are indicative of most of the Sellier & Bellot lineup, in its quality and striving to meet the markets expectations for value. The price is right, the components are the upper end of the market and the performance of the round in the field is significant. It is suitable with the larger projectile of taking just about any game in North America, though perhaps the largest bears and buffalo might not be perfectly suited to the round. The performance is certainly there to make this a contender under ideal conditions given the dangerous nature of Bear and the large size of Buffalo and like behaving/sized game.